The gorgeous sandy beach and the warm Florida sun are calling your name! Paradise Ocean is a three bedroom, three-and-a-half-bathroom home that sleeps six guests and will provide you with the perfect space to call home. Enjoy the incredible Atlantic view, large community pool, the wonderful balconies, free WiFi, convenient location to great dining and entertainment options and the easy walk to the beautiful sandy Vilano Beach. 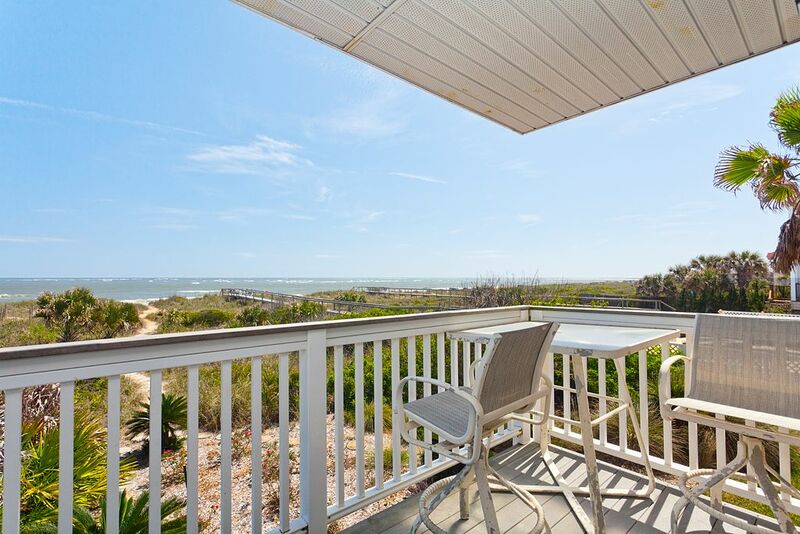 Paradise Ocean will provide the perfect home base during your St. Augustine Beach vacation! This home is spacious as well as beautifully decorated with great furnishings. As you enter, you will notice the open concept and the sliding glass doors that lead you to a balcony in the main living space. The living room features a large sofa and two chairs situated around the large flat screen television. You will be able to entertain and enjoy your guests in this bright and airy space. The spacious kitchen features black appliances and a great amount of counter space. It is fully equipped with a dishwasher, microwave, refrigerator and freezer, stove top with oven as well as cooking and eating utensils to cook up some delicious meals during your stay. The breakfast bar offers seating for two and a dining room table and seating for five. After dinner, take a step out on the balcony and enjoy the sounds of nature and watch the sunset over the Atlantic from Paradise Ocean. Kick back and relax on the private balcony from Paradise Ocean. Enjoy sipping your morning coffee as you watch the water crash on the sandy beach or dive into a good book on the incredible balcony. The balcony provides additional space to entertain your guests and truly enjoy your beach vacation. Paradise Ocean features a master bedroom with a king-sized bed, a dresser with a flat screen television, a seating area and plenty of space to make yourself feel right at home. The master bedroom has a wonderful beach feel with a calming paint color and coastal décor furnishings. Enjoy the convenience of the in-suite bathroom providing all the necessities for your stay. You will also love the access to the balcony to enjoy the gorgeous sunrises and sunsets during your stay. The second bedroom provides two twin beds and a large dresser. This bedroom also has a full bathroom offering convenience to all guests. The third bedroom offers a queen bed, en-suite bathroom and sliding glass door leading outdoors. Bed linens and towels are provided for all guests to use during your stay. You and your guests will find this home to provide the space and entertainment options to make memories for a lifetime. A washer and dryer are also available for guests to use and can help prevent overpacking! There are great amenities located at Paradise Ocean to keep guests of all ages entertained. Take a dip in the large pool, catch some rays in one of the many poolside lounge chairs, and when you are ready to visit the beautiful sandy beach, you will find that you are only steps away! Paradise Ocean is beautiful and wonderfully decorated. You will feel right at home from the moment you step into this beautiful home. If you encounter a rainy day at St. Augustine, take advantage of the shops, restaurants, and entertainment located nearby. Your Florida vacation will be one to remember at St. Augustine. With balconies that provide you a tranquil spot to rest and relax after a day in the sun, you and your guests will never want to leave! Don’t wait, call today to book your stay at Paradise Ocean! We are sorry to hear that your stay was unsatisfactory. Providing our guests with exemplary accommodations is our goal and we apologize if we simply missed the mark. We will be more than happy to review each of your complaints to ensure that they have been addressed prior to any future guest stays. Again, we thank you for your comments and we hope to have the chance to host you once more. The location and view were amazing. It does need several updates and repairs for the price. Would love to stay here again if they will catch up with required maintenance items. I'll do the good with the bad. When we booked this property we were under the impression that the pool was on one side and the beach the other. There are 6 buildings all in a row this one was right next to the beach so as soon as you walk out the door the trail to the beach is there but the trail is very overgrown, being July or at least during the summer I would imagine it be more clear. The pool is at the very other end 5 buildings down, not too far but again just a bit misleading. The pool is also very small, most of the times my family had it to ourselves but over 6 and it would be very crowded. The internet was very good. But the place as a whole needs updating, the carpet on the stairs is very stained and trampled and all the rugs and bathmats are very old, almost looks like trampled shag carpet. The blanket on the downstairs bedroom didn't appear clean and there are almost like bleach stains in the upstairs bedroom. We had spoke to someone after we arrived and we were told they were built in the 70s and haven't had a remodeling except for the kitchen and again the fridge was having some problems the first day not staying cold but started working the second day before we had to call someone. Also the front door is somewhat off its frame and is needed to be slammed about 3 for 4 times in order for it to shut. Parking is another downside, at the end in front of the building there are only 2 tiny spots and little room to turn around, you have to do a 10 point turn to leave. I've stayed at worse places and nicer but for the money paid I really expected not so many problems, it just had a dirty feel to it, most of the time I would keep my shoes or at least my socks on just not to walk on the stairs. I would not stay here again or recommend it. We are sad to hear that you did not have a good vacationing rental experience. It is never our intent to misrepresent our accommodations and if there was any misunderstandings on our end, we truly apologize. Your comments and concerns are very important and we appreciate you taking the time to share them with us. Fully committed to correcting the issues, we are reviewing your thoughts thoroughly to make sure that each problem was addressed. We know that you wanted to extend your stay for an extra day. It was unfortunate that we could not do this for you due to another booking but if you should ever change your mind about returning, we would like to offer you 10% off your next stay. Again, we thank you for your feedback and we are wishing you safe travels. The property was exactly what we needed for 3 couples. Rooms were spacious and clean. Location was perfect. Beach was steps away, and a Publix was right across the street. Access to St. Augustine was perfect- right across the causeway bridge. We weren't staying very long so we put up with the problems. The beds were comfy, the view amazing, the pool very clean.